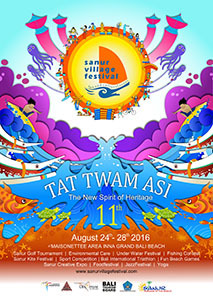 Tat Tvam Asi become the main theme of Sanur Village Festival XI event held on 24 to 28 August 2016 at Sanur beach area, which is near the Uluwatu Kuta Bali. Sanur Village Festival this year has entered its 11th year. Figures 1-1 twins is considered to have the same dimensions between right and left. With the theme Tat Tvam Asi on occasions translate the Sanur Village Festival 2016 a strategic action plans, integrated and sustainable than previous themes. According to the plan, Sanur Village Festival XI will be opened by Tourism Minister Arief Yahya on August 24, 2016. After the Ubud Village Jazz Festival the SVF event was officially opened, starting with a variety of activities from the date of August 14 to 21 2016 including Bali International Triathlon, Surfing, Tennis Tournament, Beach Clean Up, and Photo Exhibition.